When the Voice of the Lord Says: "Don't Be A Jerk." During the Lenten Season one of the antiphons for the first psalm of the day is, "Today if you hear the voice of the Lord, harden not your hearts." I used that antiphon for my morning meditation today. The text basically presumes that God is going to speak today. The question is not so much whether or not He will speak, but rather whether we will hear it and receive it. Am I ready to hear the Lord's word? Do I live my life in a way that is receptive to the Word of the Lord? Am I too distracted? Too rushed? Too preoccupied? Too obstinate? Is my heart hardened? This morning when I finished my meditation, I asked the Lord for the grace to hear His Word clearly today and to respond to it. When I made that prayer, I had in mind a certain kind of word that I'd like to hear from the Lord. Some warm assurance of His closeness or some deep theological insight that would make me feel spiritually advanced would have sufficed. You know, something that makes me feel good. Oh, the Lord answered my prayer, but not in the way that I anticipated. I heard His voice alright, but the script was not the one I provided to Him. Instead, His voice humbled me. This morning I took public transportation to a local shrine in order to go to confession. As I was riding along I did a pretty serious examination of conscience and wrote down--as best as I could recall--all of my sins. When I got to my stop, I started to move. I'm a pretty fast walker and, without even thinking much about it, was weaving in and out of the slower folks who were making their way out of the station. As I got to the escalator, there was a young guy just about to step on the escalator. I weaved around him quickly too. I felt his cane hit my shoe, but safely in front of him, I didn't bother to turn around. I just kept walking up the escalator, past all of the people who just idly ride the escalator. When I got outside, I had to wait for the cross light (another nuisance). As I got to the other side of the street, I heard a voice say, "You almost knocked me over." I turned around and it was that young guy. He was clearly angry, and I was clearly guilty. I apologized to him several times (and I sincerely meant it). He simply said, "You know, there's a reason I have to walk with a cane." And there it was. The voice of the Lord spoke. What did His voice say? It said, "Hey, stop being a big jerk." As soon as that man spoke to me, I felt convicted. Not just for my incident with him, but for a thousand other ways that I've been rude, impatient, or self-centered. I'm grateful that I heard His voice before I went into confession rather than on my way home! It is important in life to have time set aside every day for quiet prayer. This quiet time is not to limit our time with God to a specific period, but to dispose our hearts to hear His voice whenever He speaks. The people that the Lord places in our path each day are not annoyances to be circumvented or avoided, but are opportunities to encounter the Lord Himself. And in case we forget that, every so often the Lord might remind us by using one of them as His voice. Several years ago, I walked the Way of the Cross in Jerusalem and prayed the Stations of the Cross. As our small group prayed, I was struck that the rest of the city was going about its daily routine: people going to and from work, people eating, shopping, greeting friends, and going about life. It made me think of how this must have been the same as the day that Jesus carried His Cross. Very few people probably paid too much attention. The most important moment in the history of the world was taking place in front of them, but they did not take notice. Or, if they did take notice, they moved on quickly. Perhaps they were annoyed by this event because they had important things to do and places to be. When I prayed to hear the Lord's voice today, I didn't expect that the words he spoke would be, "You know, there's a reason I have to walk with a cane." Two thousand years ago a man named Simon was walking hurriedly along the streets of Jerusalem. He was busy. 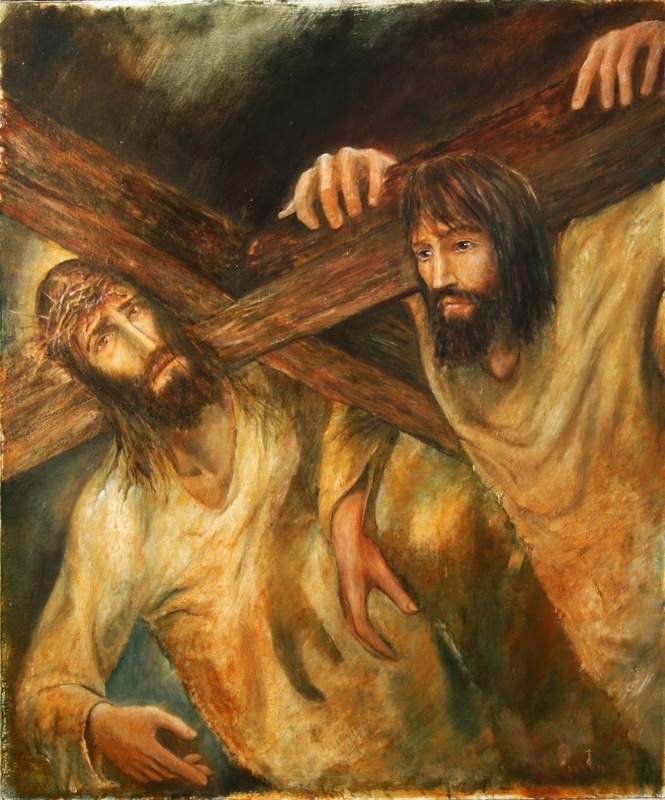 He was trying to get somewhere, but was pressed into service to help Jesus carry His Cross. Perhaps he was annoyed because He had important things to do. Maybe, who knows, but maybe Jesus said to him, "You know, there's a reason I have to walk with this Cross." One day five years ago, I found myself searching the Internet. The search terms were something that I never imagined I'd be writing: "leave the priesthood." I can't say I was on the verge of leaving the priesthood, but I was disillusioned enough to at least be reading about it. It was a little bit maddening because I knew through and through that I am a priest forever. I knew that I would always be a priest. At the same time, I had a hard time imagining myself remaining a priest in my archdiocese. I wasn't having a moral crisis, looking to get married, or rebellious against Church teachings. In fact, I was just the opposite. I had been happy in my priestly life, was a successful pastor, and found joy in teaching the Catholic Faith in all of its fullness. Then, one afternoon I received a phone call from the personnel director informing me that a new pastor was replacing me as part of a new pastoral plan. Although the thought of leaving my assignment was difficult because I really loved the people there, that was not what I found most painful. What considerably bothered me was that for a month or more after that phone call, I was left in limbo; no assignment, just hanging in the wind. The new pastoral plan for me was neither a plan nor pastoral. It felt to me how I imagined people whose neighborhoods are knocked down by city planners might feel when they are told, "Don't worry! In fifty years this neighborhood will be something really special." That's nice for the people fifty years from now, but the people who live here now don't feel too great about it. One person commenting on the lack of concern for the priests affected said, "Well, we knew there would be some bumps in the road." I remember thinking how nonchalantly one could say that if you didn't happen to be one of the bumps in the road! Most distressing to me though was the disillusionment caused by the realization that there was more at play than simply bureaucratic processes forgetting about human realities. There was that type of political maneuvering that is injurious to priestly fraternity. And that is when I began to wonder why I would want to be part of a presbyterate that treats its brothers in this way. It totally shocked me to be thinking in that way, but there I was typing those words into the search bar, "leave the priesthood." Do I think I would ever have done it? No. Thankfully, the Lord had given to me a very strong sense of priestly identity and a strong faith in what the priesthood is. But, the very fact that I was writing those words made me feel a bit like the married person who is going through a rough patch and who decides to read about divorce. None of the articles that I found really related to me because they were all about priests who opposed the Church on various moral issues, who fell in love with a woman, or who simply hated the Church. I wasn't angry or hurt because I hated the priesthood or the Church, or because I found another love. I was angry and hurt because I loved the priesthood and the Church, but felt no love in return. So, I'd like to pay it forward, in a way. I'm writing this blog post in the hope that some priest in similar circumstances might be helped in the way that I was. Let me share with you what I learned from my prayers and from my experience during these past five years. I hope that it helps you. God wants to use your priesthood. Don't deny him that chance! I know that the experience of being treated poorly can be crushing, but God takes what is crushed and uses it to bring Him Glory. Good wine comes only after the grape is crushed. Good bread requires that the wheat be ground. I cannot tell you how many times in the past five years, I've thought about Genesis 50:20 when Joseph said to his brothers, "You meant it for evil against me, but God meant it for good." For the past five years, the Holy Spirit has placed those words in my heart repeatedly. The beautiful friendships I've lived over these past five years, the conversions I've witnessed, the profound confessions I've heard, the steady flow of men entering the seminary, vesting newly ordained priests and deacons, preaching at First Masses, the opportunity to witness the spiritual depth of college students; these things, and many more, have all been an affirmation to me that "we know that all things work together for good to those who love God, to those who are called according to His purpose" (Romans 8:28). God wants to use your suffering for His Glory and to produce abundant fruit. You will also learn to love the Church in a deeper way because you're willing to suffer not only for her, but because of her. You will learn to forgive your enemies and to pray for them. You will learn that you do not need to out calculate the calculating. You will learn to have greater concern for your brother priests, to be even more fearless in preaching the Gospel, to be more attentive to the suffering of others, and to love the priesthood of Jesus Christ even more. You will have a deeper gratitude for the friendship and fraternal bond of good bishops and priests, and you will be more grateful for the friendships you share with the lay faithful . You will be a more authentic priest because you've experienced what it is like to be united not only to Christ's priesthood, but also to his Victimhood. Hang in there, brother. You are not alone. You are united to Jesus Christ! Yesterday we began Lent together by having ashes imposed upon our heads. Some of you I see every Sunday at Mass. Some of you I see at daily Mass. 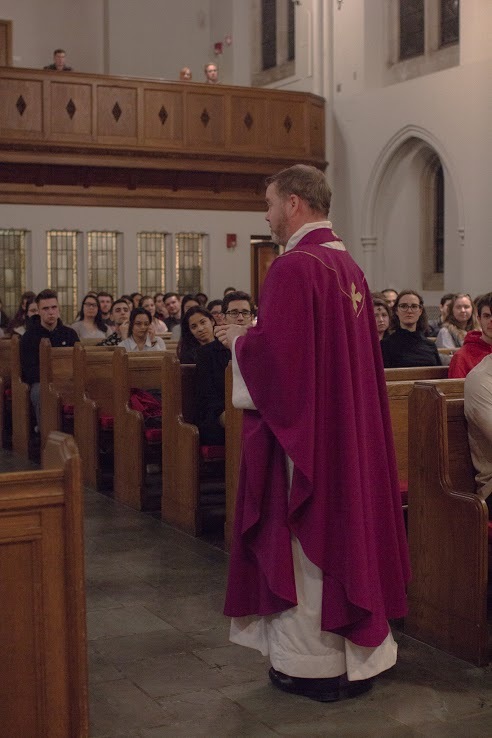 I write this letter, in a particular way, to those of you who were there on Ash Wednesday, but who are not with us during the rest of the year. No, I'm not writing this to scold you. I am writing this because of something that struck me during my third Mass of the day. As I sat looking out at all of you, I was deeply moved by your presence. In an age when the culture is becoming increasingly secular and increasingly antagonistic towards religious belief, you were in church, waiting to have some guy put dirt on your forehead. 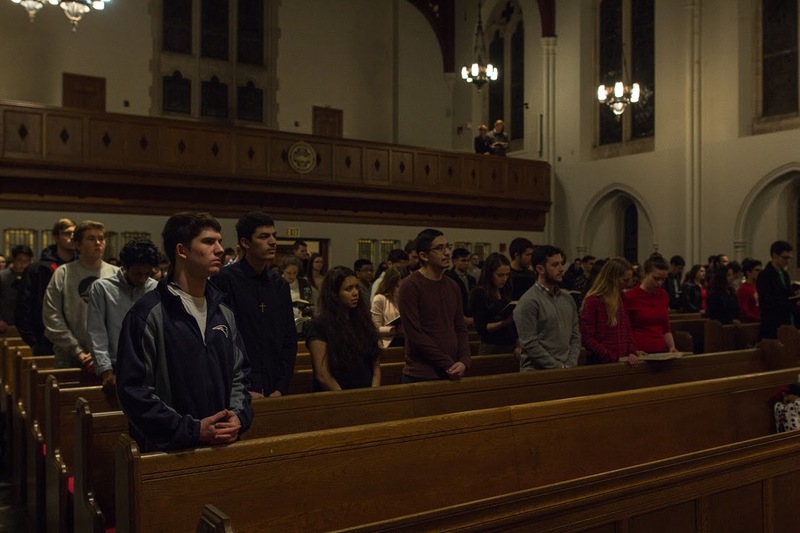 reading were being proclaimed: "We appeal to you not to receive the grace of God in vain" (2 Cor 6:1). And when I heard these words, my heart was really moved for all of you. Unlike people of past ages, you are no longer really sustained by the remnants of a Catholic culture. In other words, you aren't attending Ash Wednesday Mass out of an attachment to some archaic religious rule or custom. For the most part, we've moved beyond that in our current culture. All around you, religious practice is declining, discouraged, and derided. And there you were, bowing your head and being marked with ashes. Why? I think that you were being given a special grace. Those of you who never attend Mass or who find yourselves immersed in all manner of sin, why were you there on Ash Wednesday? I think you came because you knew that Jesus was calling out to you. In the midst of such a confusing and hostile environment, He was inviting you to repent from sin and to follow Him. He was inviting you to be His friend, to walk in His path, to be His disciple. You heard His call. Something in you was open to this invitation. You did not say, "No." And so, with St. Paul, I want to appeal to you not to receive this grace of God in vain. Do not waste this grace that he has given to you. Do you hear Christ calling you to turn away from some sin in your life? Do you hear Him inviting you to a deeper friendship with Him? Do you hear Him saying to you, "Come, follow me"? Perhaps you have been afraid to say, "Yes" to Him in the past. Perhaps you have been afraid to leave certain sins behind you. Perhaps you have been fearful that you might fail, so you never take the first step. Perhaps you feel too weak to follow. Perhaps you feel as though others are too far ahead of you for you to join in their company, as though everyone else were a Catholic expert and you the only beginner. Perhaps, you keep putting it off because you think there will be plenty of time in the future to be His friend; His disciple. But, you were there on Ash Wednesday. You were already saying, "Yes." In some small way, you said "Yes" to His grace. Today, I want to urge you not to receive that grace in vain. That grace was given to you so that you can live a full friendship with Christ. He is calling out to you with urgency and with love: "Come, follow me!" Do not let His grace be in vain. Allow His grace to permeate your whole being. Let Jesus change your life. Let Him set you free. So often in the Gospels, we see that Jesus encountered various persons as He was passing by from one place to another. This reveals to us that Christ is on the move. We can only accept His grace when it is given to us. We should not put it off for another day, because we never know whether He will pass this way again. There is an urgency to Christ's mission. On Ash Wednesday, He passed by and He saw you. He called to you because He loves you. He wants you to be at His side. You took that first step. Now, do not receive that grace in vain! Continue to walk with Him! 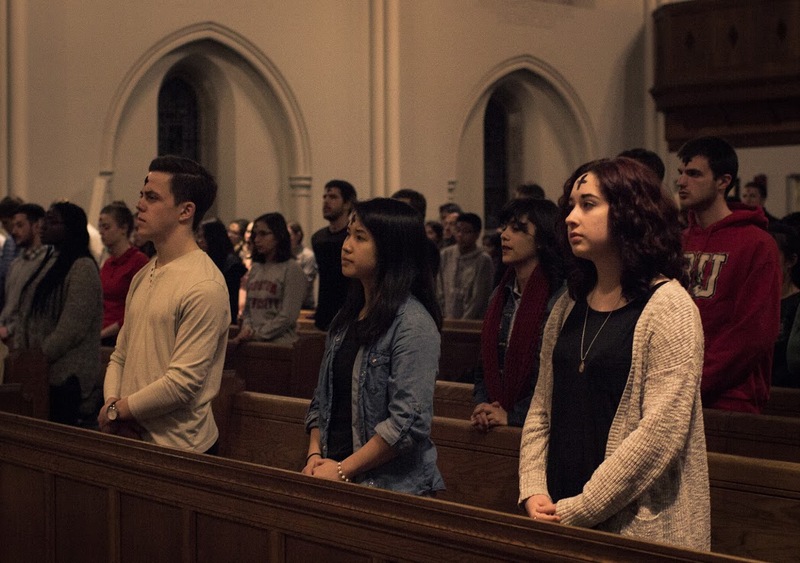 The Catholic Center community at Boston University is here for you. If you want to continue to say, "Yes" to Christ and to walk by His side, but are uncertain how to do so, please come walk in our company. We are in this together. We help one another, encourage one another, and support one another. We build one another up in Faith. As a personal example of this, I can say that your presence at Ash Wednesday Mass really encouraged me and awakened in me a desire to be a better friend to Christ and a more faithful disciple. Perhaps you could use some encouragement like that? If so, know that we are here for you. In your heart, you know that Jesus is giving you grace. I appeal to you not to receive that grace in vain! 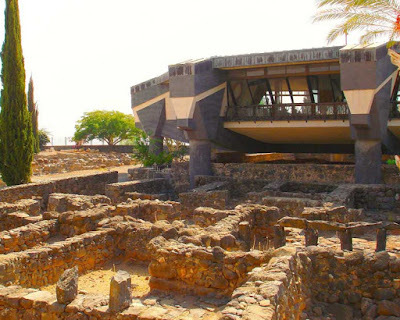 Five years ago I made a pilgrimage to the Holy Land, and of all the places that we visited, the one that most moved me was the home of Peter and Andrew in Capernaum. All that remains of their home is some ruins, over which a rather modern church has been built. What I found so moving about that place was the threshold. More than likely, the threshold that Jesus stood upon is still there. It was there, we are told in the gospels, that the entire town came and waited for Jesus to heal them. After spending hours healing and casting out demons, Jesus got up early and went to a deserted place to pray. The disciples, however, came and found him and spoke words that were far more true than they could possibly have realized: "Lord, everyone is looking for you." There are times in my life when I feel like Peter or Andrew, standing beside the Lord looking out and seeing the entire town gathered at the door. It must have been a daunting sight. It's not that some people were looking for healing or relief. Everyone was looking! Everyone was at the door. So too, today everyone is suffering. Everyone is looking for Christ. There are those suffering from the ravages of diseases and those who suffer watching their loved ones in pain. There are those who are approaching death and those mourning the loss of a loved one. There are those who suffer from anxiety, depression, or addictions. There are those who suffer from self-inflicted wounds and anger at their past mistakes. There are those who are lost and confused, those who feel abandoned, and those who feel overwhelmed. There are those who have fallen victim to the evil of others and those who have inflicted evil upon others. There are those who desperately feel the need for someone to listen to them, the need for love, the need for a friend. They come with all of their pain, their humiliation, their sin, their sufferings. They come and they stand at the threshold of Peter's house. They come to be healed by the Lord. Everybody is looking for Him. The priest stands at the threshold of Peter's House. Christ uses the priest, and allows him to feel in the depths of his soul (in some small way) the reality that "Everyone is looking" for Christ. The priest experiences in a unique way, I think, the depth of humanity's profound hunger and need for Christ. At the threshold of Peter's House, people come and entrust the priest with their burdens and their sufferings. Not always, but often enough, the priest stands at the threshold and feels in his soul the enormity of this reality, that it is not one or two suffering individuals who are awaiting the Lord, but rather "everybody" is looking for Him. These moments are filled with grace and with a union with Christ that is difficult to convey unless you've experienced it. You immediately recognize your own personal incapacity and total unworthiness to respond to this need. All you can do is allow Christ to use you as He wills. You are simultaneously emptied and filled, exhausted and reinvigorated, at the Cross and in the Resurrection. Standing at the threshold of Peter's House and looking out upon the vast sea of human suffering, you are mindful that your priestly vocation really is a mystery and a gift. It is at the threshold where Christ meets the suffering and pain of the world. You stand there so that Christ can use you as His instrument. The whole world is looking for Christ, and in some mysterious way, Christ has chosen you to be an instrument of his healing grace. Christ has placed you in an impossible situation. You are too small to meet the task and too incapable to solve the problem. And yet, this is how Christ chose to do it. He chooses, in every time and place, to entrust weak and limited men to preach in His Name and to administer His Sacraments. 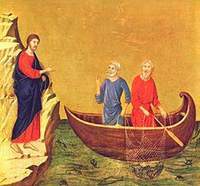 He places these men at the thresholds of Peter's House--the Church--so that all who are looking for Christ--that is, everybody--one by one, can be brought to Him and healed.